Turkey chili is great, and it's even better when you can say that you made it yourself. 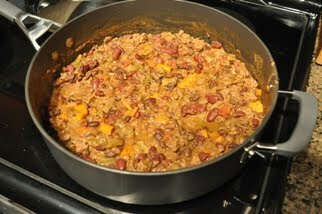 This recipe fits nicely into a slow carb diet... basically it's just vegetables, beans, and meat. It makes enough for 6-8 bowls, so count on having leftovers, which is never a bad thing. And having turkey chili already made and ready to eat after work for a few days is awesome. Give it a try, and let me know what you think. Feel free to experiment with the spices to create your own perfect blend. Set the stove to medium/high heat. In a large sauce pan, coat the bottom with 1-2 tbsp of olive oil. and heat it up. Cut into small pieces: medium onion, green onion, red pepper, green pepper, garlic, jalapeño (if you like it spicy!). Throw them into the sauce pan, and periodically stir them. Cook them until everything is tender (~5 minutes). If anything starts burning to the bottom, the heat is too high! Cover the sauce pan, heat to boiling, then reduce the heat and simmer it for a minimum of 1-2 hours. Optional (non-slow carb) addition #1: When you've added the chicken broth and you have a big soupy mixture, throw in a square of semi-sweet baking chocolate. Sounds weird, but trust me, it's awesome! Optional (non-slow carb) addition #2: Serve the chili with a sprinkle of cheese (I like Kraft shredded Mozza-cheddar) and a spoon of sour cream. Optional (non-slow carb) addition #3: Serve it up with a bowl of tortilla chips!